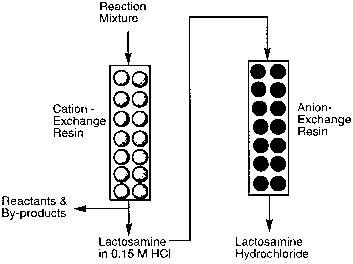 Figure 7 Separation of lactosamine from an enzymatic reaction mixture with ion exchange resins. the a-d-Galp-(1 ^3)-j3-d-Galp-(1 ^4)-j3-d-GlcNAcp-(1 ^3)-j3-d-Galp-(1 ^4)-0-d-Glcp-R pentasaccharide (22), a one-pot enzymatic synthesis was designed that included two sequential enzymatic glycosylations using a1,3-galactosyltransferase and ¡1,4-galactosyltransferase that share a common UDP-galactose donor. In situ cofac-tor regeneration cycles of the donor were applied to avoid stoichiometric use of the expensive nucleotide sugar donor and product inhibition of the transferases. The starting trisaccharide was prepared through an established stereospecific glycosyla-tion . It is noteworthy that almost all the starting trisaccharide 20 was consumed in this high-yielding and efficient one-pot synthesis. The corresponding intermediate 21 and product 22 were obtained in 53 and 35% yield, respectively (Fig. 8).